Terminology in early metallurgy is more confusing than tomahawks. Terms that mean one thing in the 18th or 19th C. can mean something entirely different today. Also processes and materials and marketing all had a bearing on what the terms meant--just as with tomahawks. Metallurgy was a developing science back then and not every process was understood to the molecular level as it is today. In some respects, it was more an art than a science then. Things worked when they used a process but they didn't always know why until later on. Here is a brief introduction. "Cast iron" is referring to both a process and a type of iron. All cast iron is poured at ~2450 degrees into a mold to be formed, usually two half molds bolted together, although today there are other methods. There are 5 different kinds of cast iron today. Usually there is an injection port (small opening) to force it through. 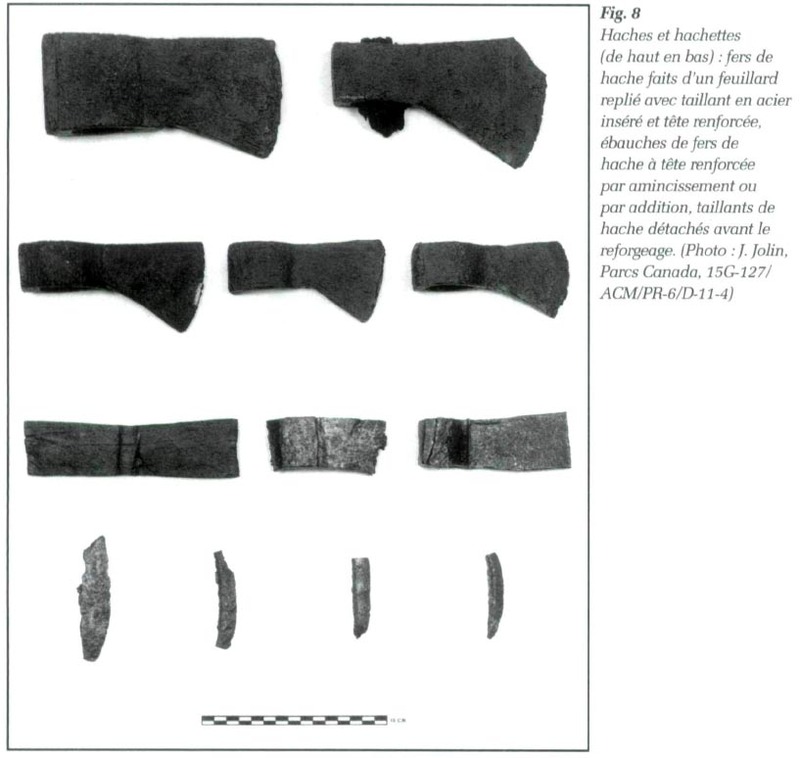 The very high carbon content of cast iron made it brittle so as a striking weapon or tool it had serious limitations. Ductile cast iron, also called ductile iron, (the type that resists impact breakage) wasn't invented until WWII. 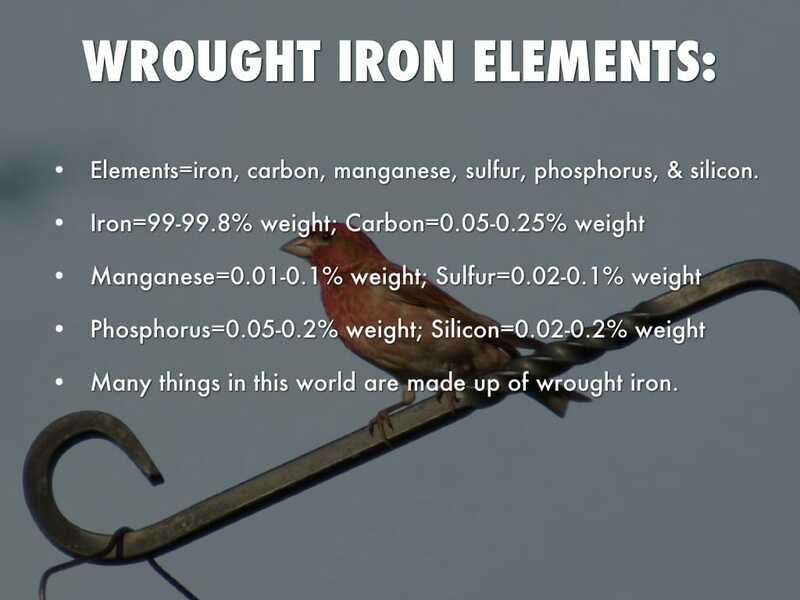 Cast iron is primarily composed of iron (Fe), carbon (C) and silicon (Si), but may also contain traces of sulfur (S), manganese (Mn) and phosphorus (P). It has a relatively highcarbon content of 2% to 5%. It is hard, brittle, non malleable (i.e. it cannot be bent, stretched or hammered into shape) and more fusible than steel. Its structure is crystalline and relatively brittle and weak in tension. Tomahawks & axes were not made of cast iron during the period for these reasons. One important point that many people don't understand is that not all cast iron/steel will have a casting seam visible. There are many different methods such as investment casting that do not leave a seam. 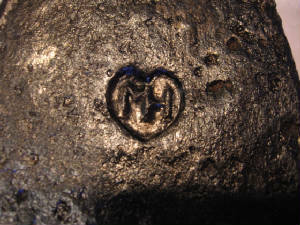 The temporary mold itself is destroyed in some methods after the molten iron is poured. Vacuum methods, lost wax casting, plaster molds, etc would not leave a visible seam. Just because you don't see a casting seam does not necessarily mean it was not cast in a mold. In the 18th and 19th C. the term "cast steel" meant something different than it does today. Back then finished products made of cast steel were NOT cast in a mold like they are today, it was forged. The cast steel of the 19th C. was referring to the Crucible process where molten steel was "cast" or poured to make steel ingots within the crucible. Then that ingot was later reheated and forged to make the desired object. Why does it matter? If you see an 19th C. axe with a raised seam formed from a mold then it is made of cast iron, not cast steel. All steels have about 1% carbon or less being the reason they are not as brittle as cast iron which is 2-5%. Bog Iron is a type of crude iron ore usually high in impurities used in 17th C. America that was forged like any other iron. The iron was derived from old bog areas. Bog iron was never cast in a mold. Drop forging is a machine process where a successive series of stampings force the metal into a particular shape. Eyes are usually punched out on these in a single blow while the steel is red hot. These can be made of steel, cast steel or iron but not cast iron. Wrought iron is referring to iron ore heated and hammered into shape by forging. It is 'wrought' into shape. Same as hand forged. It is also considered an alloy of iron. Foundries made the refined wrought iron "merchant" bars as stock for blacksmiths to use for forging all over the continent. The percentage of elements added to wrought iron or steel are usually minuscule yet have an enormous affect on it's properties. For example, steel that has a low carbon content is easier to sharpen but also the edge does not last very long. Steel with high carbon is just the opposite. Yet we are only talking about less than 1 % carbon content for both types of steel. Case Hardening (surface hardening) is wrought iron which is heat treated with carbon for a short time to introduce the additional carbon. Usually it only treats the surface because it cannot penetrate any further with this technique. Case hardening can help wear resistance but will still not be as strong as steel unless the wrought iron is so thin it penetrates completely. How is hand forging different from machine forging? It is essentially the same process except either a man or machine is doing it. Hand forging of hatchets, knives, etc. continued well into the 20th C. Even though the machines were available to produce them faster and more efficiently, many small manufacturers could not afford the upgrade. Fighting Iron, A Metals handbook for Arms Collectors by Art Gogan, 1999. American Iron 1607-1900 by Robert Gordon, 1996. As stated previously, steel was expensive to produce in the 19th C. and earlier so iron was used for the body of most axes with a smaller piece of steel added to the iron. 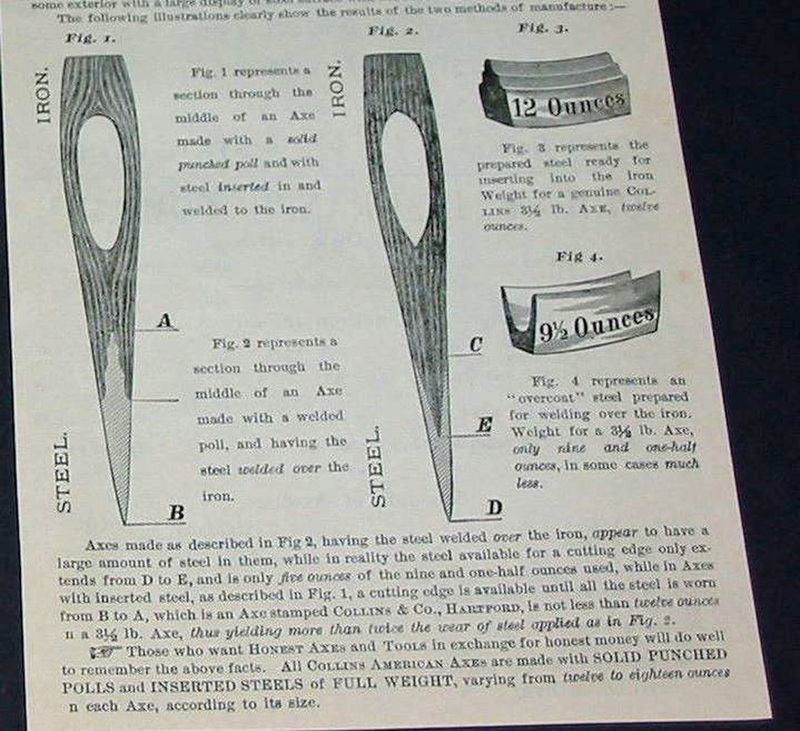 This 1894 Collins advertisement shows 2 techniques for "steeling" edges of axes--the overlay method and the insert method. Its also noteworthy that they were still steeling the edges of iron axes in 1894. When the term forge welded is used it does not leave a raised bead as in arc welding. Instead it is done with a layer of borax between the layers when reheated to forge weld them together. A 3rd method of steeling an axe edge is to forge weld a short layer of steel on one side only of the blade edge--called the "lap method". This was something local blacksmiths often did when "re-steeling axes" in the field. 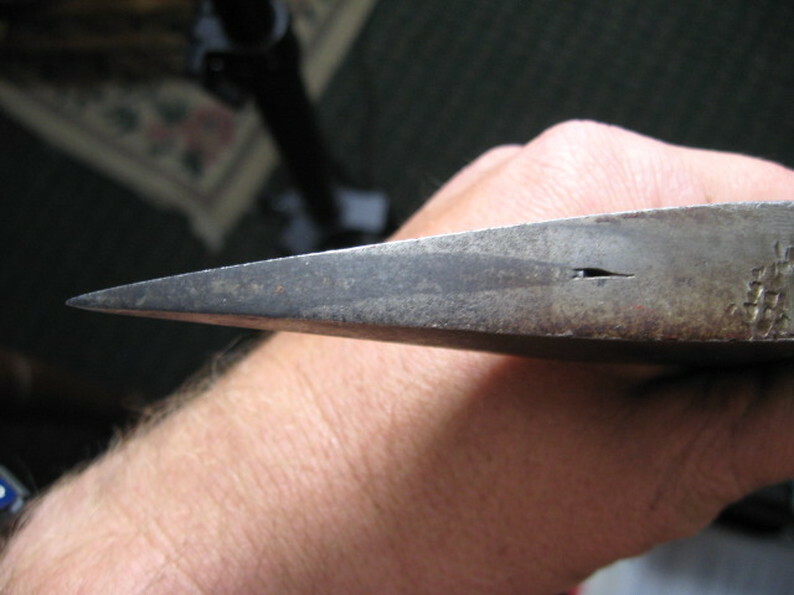 It was a quick and effective method because as the edge was worn down and resharpened more steel would be exposed. 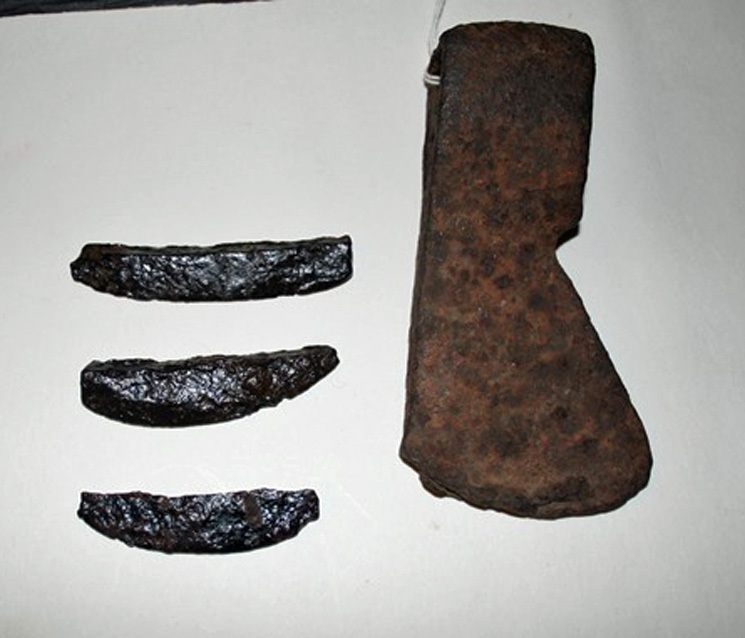 These 3 steel bits were excavated in the 1920's at a 18th C. Seneca village in upstate NY awaiting to be inserted into worn out axe blades or in new ones. Blacksmiths were often sent to work for a tribe on site to satisfy treaties or to appease their war time alliances with European countries. It has been spuriously published that most of these blacksmiths came from England and France. My research as shown far more were made in North America. The alloy known as "German silver" is frequently noted as the metal employed for "silver" trade goods after 1850. This alloy is a mixture of copper, nickel, and zinc, with the best examples being in the proportions 16:20:31. Notice, no silver. Dr. Arthur Woodward stated he thought coin silver was being used after 1830. Well there is much more to it than that but that is another website. Soldiers in the Revolutionary War, French & Indian War and War of 1812 used tomahawks too! You are hereby ordered and directed, to compleat yourself with ARMS and Accoutrements, by the 12th Instant, upon failure thereof, you are liable to a FINE of THREE POUNDS; and for every Sixty Days after, a FINE OF SIX POUNDS, agreable to Law. A good Fire-Arm, with a Steel or Iron Ram-Rod, and a Spring to retain the same, a Worm, Priming wire and Brash, and a Bayonet fitted to your GUN, a Scabbard and Belt therefor, and a Cutting Sword, or a Tomahawk or Hatchet, a Poach containing a Cartridge Box, that will hold fifteen Rounds of Cartridges at least, a hundred Buck Shot, a Jack-Knife and Tow for Wadding, six Flints, one pound powder, forty Leaden Balls fitted to your GUN, a Knapsack and Blanket a Canteen or Wooden Bottle sufficient to hold one Quart." Interesting that a "hatchet" was interchangeable for a tomahawk. 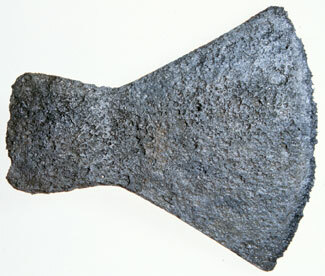 A SMALLER VERSION OF BRITISH FELLING AXE FOUND AT FORT EDWARDS, NY. 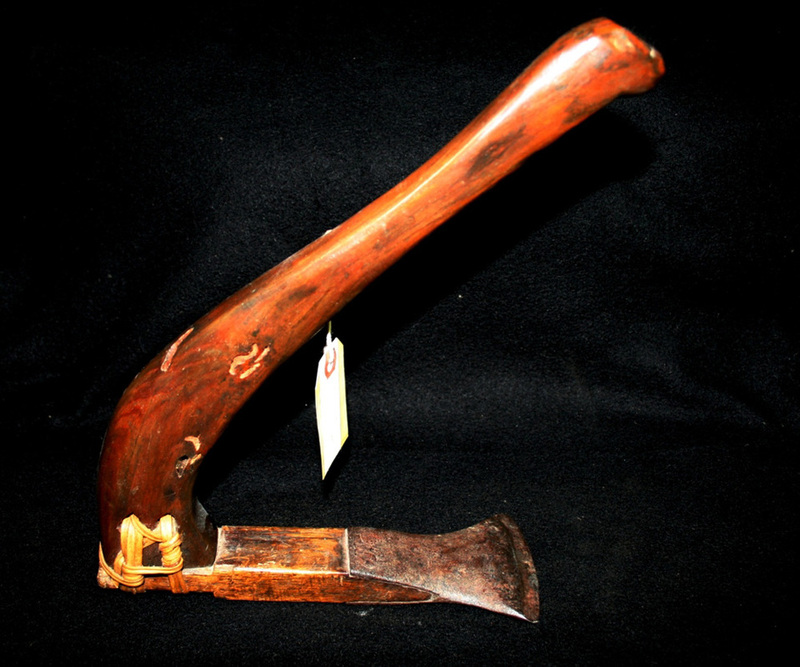 Notice how the poll on this hatchet has been cut off and the remainder riveted to the adze. The hatchet blade was hand forged. 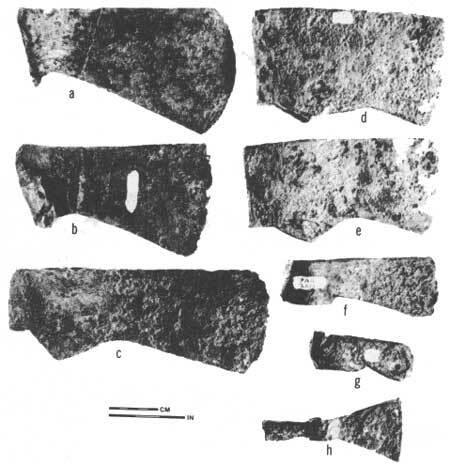 These type adzes were frequently used along the Northwest Coast to shape totems. The upper portion of wood has been replaced more recently with wormy lumber that was shaped & artificially aged for display purposes. 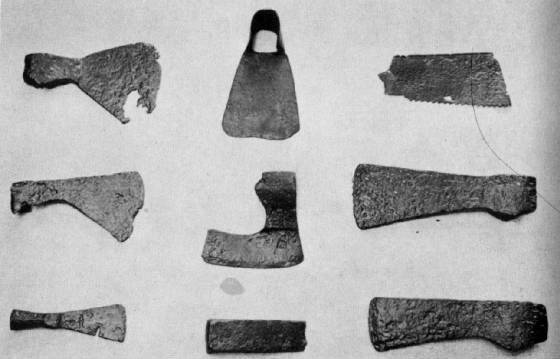 Some Jamestown tools and axes found in archaeological digs.